Biodynamic wines from the shores of Lake Neusiedl in Burgenland, Austria. "Velue" is the old name for Velm-Goetzendorf, the name of the old willow trees, which grow near the river. The Velue wines are nature-based and fermented spontaneously inside stainless steel tanks. The Velue Riesling is originated from the area Haidthal. The eastern-facing slope of the Haidthal provides ripe aromas and minerals. The grapes of this wine are harvested by hand and carefully selected. After a short maceration time the Velue Riesling becomes spontaneously fermented at 23-25°C inside a steel tank. malolactic fermentation with battonage for 5 months on the lees. Unfined, unfiltered. PROFILE: Rich flavor of yellow fruits with extreme spice and minerality on the finish. Savory profile is a result of malolactic fermentation and lees contact during a long fermentation. WINEMAKING: Long maceration, slow and gentle pressing more than 8 hours, fermented with natural yeasts and matured 4 months on the lees, with Battonage. MORE ABOUT THE WINE: The “Kellerberg” vineyard is the heart of Johannes’ winery. Next to the vines, several types of thyme were planted for greening. The thyme is harvested to make tea and extracts. The old Veltliner vines are constantly providing the same high quality of wine every year. The "Reflexion- Kellerberg" is made of 100% physiological and ripe grapes, which are harvested by hand. For the production of this wine, grapes of the second round of the harvesting process are used. PROFILE: Apricot, Christmas spices, brioche, a bit of terra cotta. The Chardonnay provides fruit, weight, texture. The Scheurebe is there for floral characteristics. The Riesling solera is the structural backbone of the wine, it is there for acidity and a rocky mouthfeel. GRAPE GROWING: Certified organic and Demeter bio-dynamic. Johannes uses Demeter treatments 500 (horn manure), 501 (horn kiesel mountain crystal) and 507 (herbs and valerian to help with frost and vine relaxation). 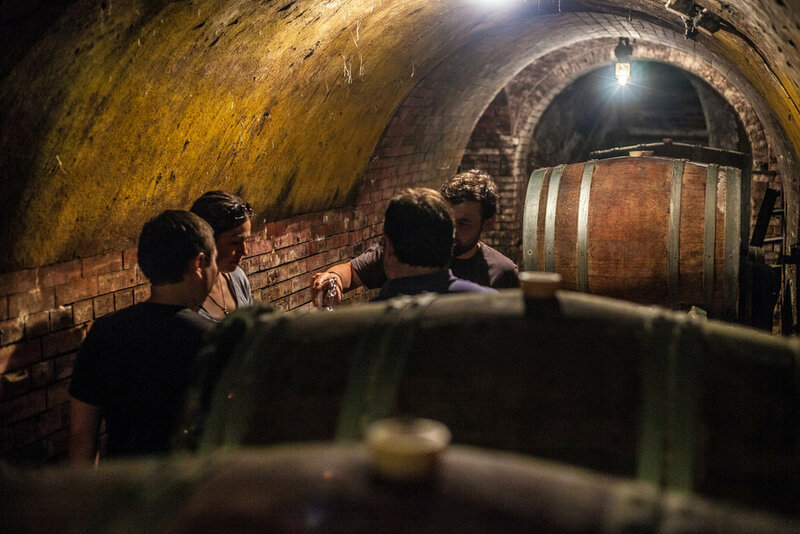 A small group of local winemakers co-produce the fermented manure 30km from the vineyard. Needless to say, all grapes are manually harvested. WINEMAKING: 50% Chardonnay (intercellular fermented in 500 lt amphoras to 5.5-6%). After intercellular, it is co-fermented with 25% Scheurebe (from stainless) the rest of the way (short must fermentation). Finished with 25% Riesling (Solera-system of vintages 2013, 2014 and 2015, in wood). Untreated, unfiltered with zero sulfur addition. MORE ABOUT THE WINE: The "Solera-System" of Riesling which has been built up since 2013 gives character to this wine. Structure comes out of the must fermentation of Chardonnay from selected berries and grapes which is done in amphoras of 500 liters. The revolutionary taste of this wine is the result of nothing added nothing removed winemaking. 100% Zweigelt. Certified organic and Demeter bio-dynamic. Johannes uses Demeter treatments 500 (horn manure), 501 (horn kiesel mountain crystal) and 507 (herbs and valerian to help with frost and vine relaxation). A small group of local winemakers co-produce the fermented manure 30km from the vineyard. Needless to say, all grapes are manually harvested.Fermented in stainless steel, slow and gentle pressing, stored in big, old barrels of oak and small, used barrels of acacia. Unfined, unfiltered. "Velue" is the old name for Velm-Goetzendorf, the name of the old willow trees, which grow near the river. The Velue wines are nature-based and fermented spontaneously inside stainless steel tanks. The Velue Zweigelt is originated from the area "Haidthal" and "Sonnberg". Both areas are windy and chilly. That gives you the advantage of late harvesting, thus the wine is physiological, ripe and has a moderate alcohol concentration. The Zweigelt has a subtle aroma, which perfectly fits this type of wine. The grapes are harvested by hand and carefully selected. WINEMAKING: Fermentation in open vats, slow and gentle pressing, stored for 18 months in 1500 liter barrels of acacia and oak. No new oak influence. 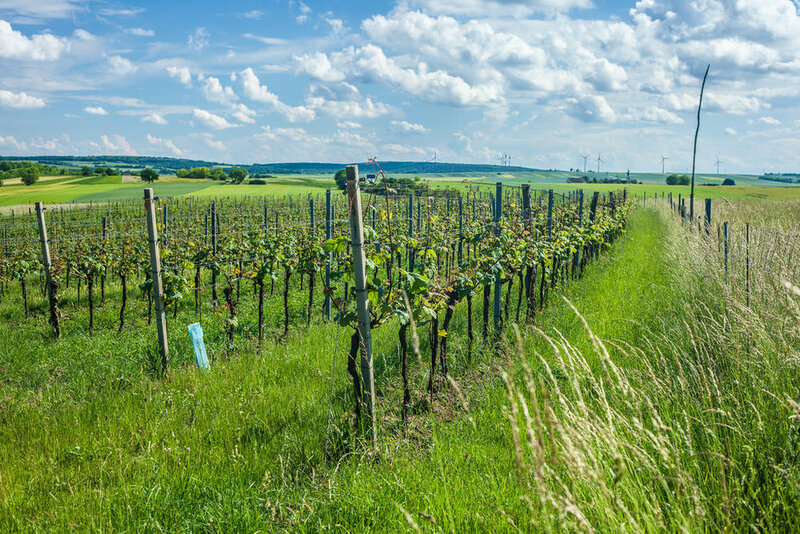 MORE ABOUT THE WINE: The "Steinthal" vineyard is one of the most traditional locations in Johannes’ village of Velm-Götzendorf. Next to the vines, several types of thyme were planted for greening. The thyme is harvested to make tea and extracts. The old Sankt Laurent-vines are constantly providing the same high quality of wine every year. The “Reflexion- Steinthal” is made of 100% physiological and ripe grapes, which are harvested by hand. For the production of this wine, grapes of the second round of the harvesting process are used. PROFILE: A deep hue implies a juicier wine, but that is not quite the case here. The intense color is followed by a light pomegranate and cranberry aroma. This wine is incredibly delicate and has a floral quality of rose petal and violet. The acidity is quite refreshing as well. GRAPE GROWING: Hand-sorted from selected old vines from one of the oldest St. Laurent Vineyards in Austria (~100 years), Lage Steinthal. Harvest done by hand in the middle of September. WINEMAKING: Whole cluster bunches are placed directly into 500L amphorae for a very slow intracellular fermentation using native yeasts. After 7 months, the grapes are pressed and the juice is combined with more St. Laurent base wine for a full fermentation. MORE ABOUT THE WINE: It's a direct pressed Rosé, but out of fermented Grapes. The wine technically goes through two fermentations to get it to the final alcohol level.